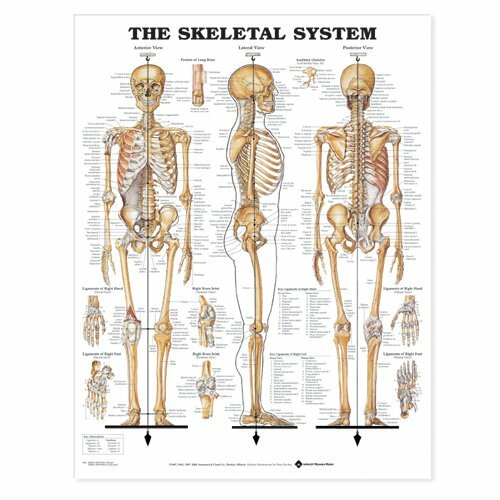 This classic chart of The Skeletal System was illustrated by Peter Bachin in 1947 and continues to be one of our best sellers. Every illustration is finely detailed and labeled. The chart features 3 large illustrations showing the anterior, lateral and posterior views of the male skeletal system. Eight smaller illustrations show: a portion of long bone, auditory ossicles, ligaments of the right hand (dorsal and palmar views), ligaments of the right foot (dorsal and plantar view) , the right knee joint (anterior and posterior views), Comparison of female pelvis to male pelvis is shown by a dotted outline.